Diepenbrock dedicated the months May and June 1911 to a radical revision of his symphonic song Im grossen Schweigen (In the Great Silence, RC 67). After its completion on 8 July, Hölderlin’s poetry formed the inspiration for a new song. On 12 July he notated three measures of a setting of the poem Am Abend (In the Evening) for mezzo-soprano and piano. 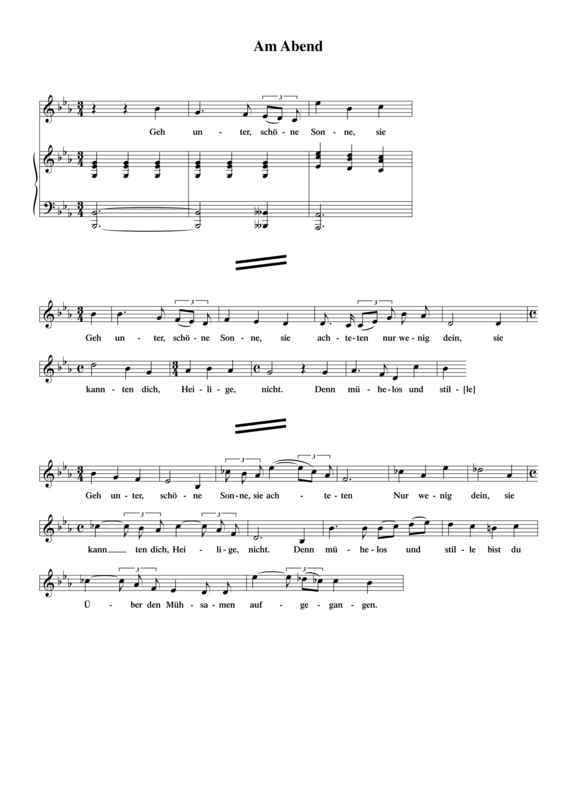 Clearly he was not pleased with the tenth leap on the words “schöne Sonne” (beautiful sun), because on the bottom half of the page he started the melody again with a much more gradual progression, the first big leap being on the words “sie kannten dich, Heilige, nicht” (they knew you not, Saint). However, two days later Diepenbrock also rejected this melody and once more began all over again. This time he wrote a self-contained setting of the first strophe of the poem. All these versions are in the key of E-flat major, but the third version is predominantly coloured by the note c-flat, the lowered sixth. Hölderlin’s poem is an ode to the woman of his life. In 1796, after completing his studies, Hölderlin was taken on as a private tutor by the banker Jakob Gontard and fell desperately in love with his wife Susette Borkenstein. The character of Diotima from his epistolary novel Hyperion was modelled after her. Diotima was the seer-priestess who introduced the young Socrates to the concepts of good life and beauty, and love as a means of contemplating the divine. In his poem Am Abend Hölderlin identifies Diotima with the sun, which he reveres as “the heavenly messenger”. Gratefully he looks up to her as the bringer of the golden day: even more lively do the brooks babble and lovingly the blossoms scent. However, the opening lines are about the sun that is underrated by the majority of people: Set, beautiful sun, they have paid little attention to you, they knew you not, Saint. The difficulty must have lain in the length of that specific poem. It is not surprising that his choice then fell on Am Abend, which also deals with a farewell. Its other main theme is the sun being undervalued by others as goddess of love and source of wisdom. Every day the first person main character of the poem is aware of the sun’s presence in his life. In other words: Johanna will remain the muse for his creative work. Nur wenig dein, sie kannten dich, Heilge, nicht.